During the second week of school this year—safety week—students and teachers employed a new evacuation procedure for the first time in years: one that involved their waiting in their classrooms for one minute before slowly and cautiously walking towards the exits closest to their classrooms, all while vigilantly assessing their surroundings for threats. Of course, the new protocol was not followed by everyone—some classes left their rooms immediately upon hearing the alarm. Other students were ambivalent about leaving their classrooms after seeing other classes still in their rooms and ended up standing idly in the hallway for some time. The reason for implementing the new fire drill procedure this year was because the fire alarm could easily have been pulled by someone whose intent was to harm students entering the halls. Although this may not have been a concern in previous years, the recent rise in school shootings makes this a more plausible threat. This new procedure might remind many students of another drill last school year, in which a hard lockdown drill was initiated, only to be followed by a fire alarm minutes later, confusing students who were unsure of whether to exit the building or to stay in and hide. The new procedure makes me think of how much fire drills have changed. I recall participating in fire drills in elementary school, after which the principal would gleefully announce that we had broken our school record for the fastest evacuation, or that we would need to be much quicker next time. When students hear a fire alarm today, it confuses and discombobulates them. Instead of receiving a clear message from the alarm, students are never absolutely sure what kind of emergency might be happening in the building. The current state of affairs and the reality that students and staff must always be in fear of a possible shooting is saddening. 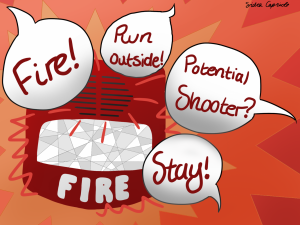 It is upsetting to see students unsure of the situation they are in when a signal designed to mean “fire” is blaring in the background, not to mention that it can be frightening and inconvenient. To solve this issue, we must ensure that when the fire alarm sounds, it solely means that there is a fire in the building. Perhaps to achieve this, staff would be the only ones allowed to pull fire alarms. This could be accomplished by having a normal lever on the wall labeled “fire,” which anyone can pull, but instead of directly signaling the alarm, the lever alerts a staff member or hall monitor via an electronic device. The official could then go and investigate the situation. If necessary, he/she could use the same electronic device to trigger the actual fire alarm or perhaps initiate a hard lockdown. This new method might have helped prevent the confusion from a few weeks ago, when a student accidentally pulled the fire alarm. Emergency personnel were called to the school, and students waited near the school’s entrances for some time while rain poured outside. This incident could potentially have been prevented if instead of immediately sounding the alarm, the lever in the wall alerted a staff member to investigate the area and recognize the student’s honest mistake. With this approach, students can be confident that the person who triggered the fire alarm was a staff member and not a malevolent or even simply absent-minded student. Students can be sure that they aren’t in danger of being harmed by another student while leaving the building due to a fire. The label “fire alarm” would be an accurate one, because the alarm will ideally only go off only when there is an actual fire. It might be argued that a downside to this approach is the longer amount of time it might take for the actual alarm to sound. While it may be true that it would take a little longer for staff to investigate the source of the hazard and sound the actual alarm, the extra time would probably be no longer than the extra time it takes students to wait in their classrooms and to cautiously leave the building. Of course, schools were built with fire safety in mind, and there have been more deaths in schools due to violence than fire. Assistant Principal Mark Langer noted that the last death due to a fire in a school was on December 1, 1958, at Our Lady of the Angels School in Chicago. While we must bear this fact in mind, the uncertainty of what a fire alarm means still haunts students during drills. It would be ideal if students could be exactly sure of which type of drill they are participating in. This could easily be accomplished by having staff alone make the choice of which alarm to pull. While this new procedure may never be implemented, schools should be mindful of the fact that new procedures like the one we’re currently using might send mixed and even the wrong signals to students. These signals do more than just guide students in the wrong direction—it could potentially put them in danger as well. I hope that one day, fire alarms will mean only one thing: there is a fire. Face-Off: Is the NFL too dangerous for players?